"The Glider Riders" "The Towed-Target Infantry"
"We will have airborne armies. Our present fortifications will become useless...our artillerymen will learn to shoot in flight. The kingdom will require the new position of secretary of state for the air forces." Worn by airborne troops who rode gliders instead of parachuting into combat. After one combat mission, Glider Pilots were also entitled to wear this badge of distinction. 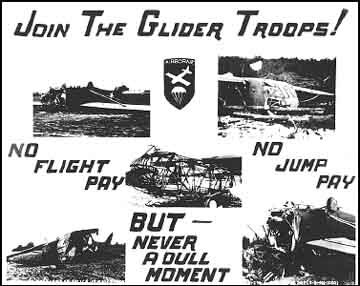 The Glider Infantry rode the gliders into combat, flying in the same sky convoys as their paratrooper comrades but, for some time, they were excluded from the hazard pay the paratroops received. Eventually, after it became apparent that riding a glider was often more hazardous than jumping, this injustice was corrected and they began to receive hazard pay although it was half what the paratroopers received. When asked, most paratroopers preferred jumping to riding a glider. This was easy to understand since Glider Pilots and Glider Infantry wore no parachutes in combat missions. The added weight of the parachutes meant that fewer troops and supplies could be carried in each glider. Awarded to units of the United States Army and their allies for exhibiting extraordinary heroism as a unit in such a way as to set the unit apart from other units. Known as "The Distinguished Unit Citation" during WWII, it was later renamed "The Presidential Unit Citation." These troopers consistently distinguished themselves in combat. As one veteran Glider Pilot explained after visiting this site, "You are very generous in your praise of the Glider Pilots but the real heroes were the Glider Troopers who were not volunteers but who covered themselves with glory in combat. 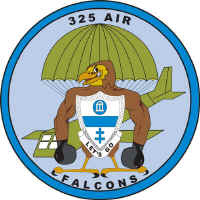 For example: The 325th Glider Infantry Regiment of the 82nd Airborne Division received the Presidential Unit Citation for an outstanding combat record in Normandy. The Glider Troops were the equal of anybody on the ground." Awarded to Army infantrymen with the infantry MOS who served in action against hostile forces. This is one of the most coveted badges in the U.S. Military. It immediately identifies the wearer as someone who has served in battle. 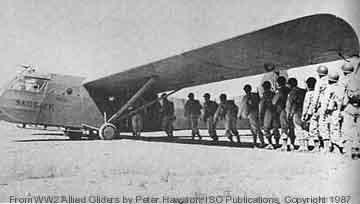 Glider Infantry loading into a Waco CG-4A. The Waco could hold up to 13 troops. 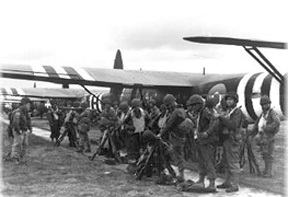 U.S. Army Signal Corps Glider Infantry loading into a Waco for the D-Day behind-the-lines drops. 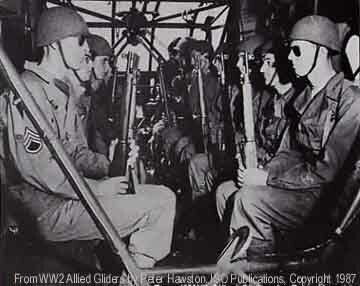 American Glider Infantry in position for takeoff inside a Waco CG-4A. Note the metal tubing frame. The British Horsa glider was larger and held more troops but was made of wood substituted for metal during wartime scarcities. The Waco's metal construction gave it more strength and slightly more protection on landing for the troops. 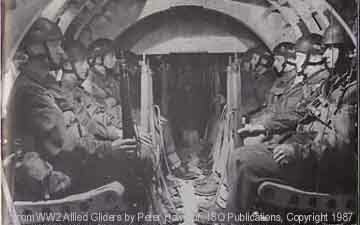 British troopers inside a British Horsa Glider. The Horsa and Waco were both used by British and American Glider Infantry. 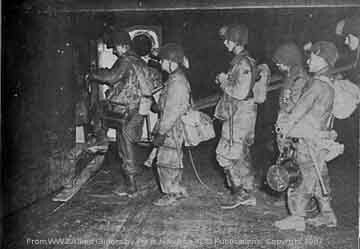 Elements of the 101st and 82nd Airborne Divisions flew into Normandy in the Horsa piloted by American Glider Pilots. 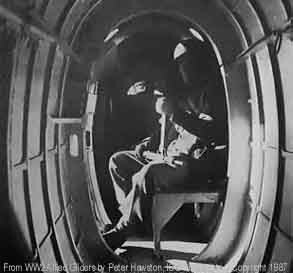 Trooper inside a British Hotspur glider, smaller than both the Horsa and Waco. A Waco turning over on landing near Nijmegen, Holland during Operation Market Garden. 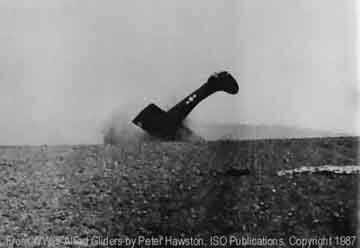 Crashed Horsas - Ironically, Glider Infantry initially did not receive jump pay since their training and combat assaults in gliders were considered safer than jumping. After casualties proved otherwise, this injustice was corrected. Glider Infantry waiting to board Horsas. 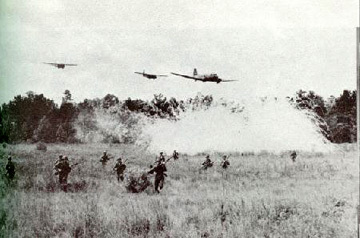 Glider Infantry on ground as a C-47 double tows two CG-4As into the insertion point. This is a photo of a staged exercise, not a combat image. Poster summing up the Glider Infantry's opinion of the distinction drawn between them and Paratroopers (Artist Unknown).